Once Upon a Time has been nothing short of a rollercoaster ride the past seven years, but it’s coming to an end this May. With the final episodes approaching, here’s everything you need to know before the winter premiere! The midseason premiere, titled “Secret Garden,” is slated to air on Friday, March 2, 2018, and will kick off the final twelve episodes of the series. The series finale, whose title remains concealed, is slated for May 18, 2018. As the above trailer notes, the “war of the witches” is upon Hyperion Heights. Gothel (Emma Booth) is assembling her Coven of the Eight. With the coven’s true motive still unknown, there’s no telling what sort of havoc our heroes are in for. The Coven of the Eight is unfortunately not the only obstacle the heroes must overcome. Entertainment Weekly learned that “there is an awake fairy tale character that is out for revenge and starts to exact it in Seattle against people who have no idea what they’re up against,” and that this character “has a very specific target.” Hint: It may end up being Dr. Facilier (Daniel Francis), since he is set to return and has a complicated history with Tiana (Mekia Cox). On a brighter note, fan-favorite Alice (Rose Reynolds) will be sharing the screen a lot more in the second half of the season. The fall finale gave viewers a glimpse of Alice’s relationship with Robin (Tiera Skovbye), but the show’s creators promised in an interview with TV Guide that what was shown was only a jumping off point: Viewers will get to see not only how the couple met and fell in love, but also how their cursed personas find their way back to each other. Aside from her time with Robin, viewers will also likely see how she escaped the tower she was abandoned in as a baby. Episode 14 is titled “The Girl in the Tower,” and no one’s story fits this title more than Alice’s. Furthermore, viewers will see the “other places” Alice has been. Rose Reynolds also teased on her Instagram that viewers will learn more about iconic troll that rests underneath the Aurora Bridge in Hyperion Heights. Alice either being the Guardian or being involved in the Guardian plot would make sense considering it was hinted in the fall finale that Rumplestiltskin had given up something for Alice’s happiness. While Rumple is trying to find his way back to Belle, Regina (Lana Parrilla) and Zelena (Rebecca Mader) will have their own love lives to sort out. When Regina found Zelena and brought her to Hyperion Heights, she was informed that Zelena is engaged. Her fiancé, Chad, will debut in episode 17, “Chosen.” Co-creator Edward Kitsis teases that Zelena’s engagement is “emotionally complicated” due to her status as the Wicked Witch of the West and him being native to the Land Without Magic. Meanwhile, Regina will be finding a new love interest. Entertainment Weekly learned that the new love interest is a character viewers have already met. The creators further say that it is someone with whom Regina has a complicated past. I have my own personal guess of who the love interest is, but comment below with who you think it may be. 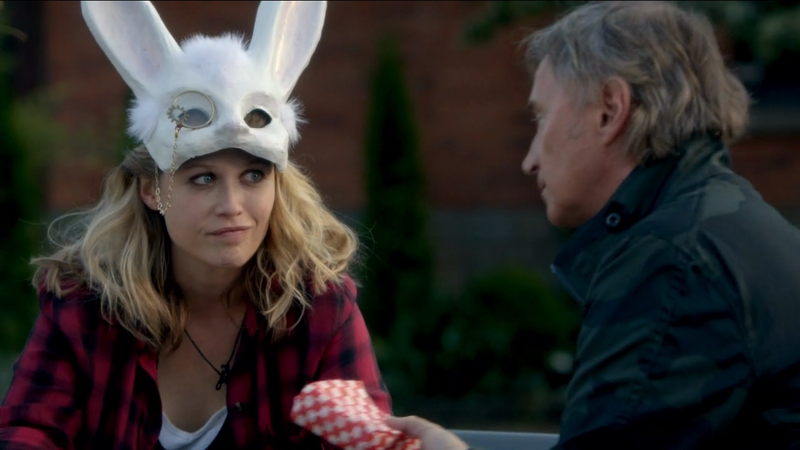 The above sneak peek shows that viewers will be treated with flashbacks to Storybrooke. Robin doesn’t appear to be a natural with magic like her mother was, so it will be interesting to see how this scene connects to the present day plot surrounding Gothel and her coven. Finally, as revealed in a Hot Seat article, a familiar character will be dying soon after the show’s return. With the tides of power shifting to Gothel, Rapunzel Tremaine (Gabrielle Anwar) and Drizella (Adelaide Kane) appear to be good candidates. Who has been your favorite character this season, and what are you hoping to see in the final episodes? Comment below and tweet us @Fuzzable with your love for Once Upon a Time!